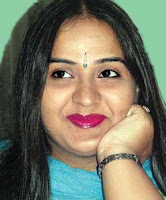 Actress Radha was the most popular Kollywood actress between the years 1980s and 1990s. She was born on October 3, 1965 at Kallara village near Trivandram, Kerala. Her real name is Udaya Chandrika and transformed as Radha when she was first introduced by the famous Tamil film director Bharathiraja in his film Alaigal Oivathillai released in 1981. Actress Radha is also a talented classic dancer. She acted with almost all the top heroes of Tamil cinema and has conquered millions of fans in Tami Nadu by her wonderful performance. Rajini Kanth, Kamalhasan, Vijayakanth, Karthic, Mohan, Sathyaraj are some of the top Kollywood heroes acted with her. She was really lucky to play opposite with the most popular actor of Tamil film history Dr.Sivaji Ganesan in the film named Muthal Mariyathai, directed by Bharathiraja and released in 1985. Kathal Oviyam, Kathal Parisu, Sigaram, Gopurangal Saivathillai, Amman Koil Kizhakkale, Oru Kaithiyin Diary, Nan Mahan Alla, Japanil Kalyanaraman, Thoongathe Thambi Thoongathe are some of her Tamil box office hits. Besides Tamil films she also acted in many Malayalam, Telugu and Hindi films. Kodama Simham, Rudranetra, Kondaveeti Donga, Manchi Kutumbam, Adavi Donga and Agni Parvatam are some of her super hit Telugu films. In the most of her Telugu films, she starred with Tollywood popular actor Chiranjeevi. Bewafa Sanam, Vicky Dada, Phool Aur Patthar and Faoladi Mukka are some of her Hindi films. Though she is from Kerala, she acted only in a few number of Malayalam movies. Revathikkoru Pavakkutty, Innathe Programme, Ayitham, Irakal and Mortuary are some Malayalam movies in which Radha acted. We can enjoy here some of the super hit video songs of actress Radha from her different films. The above melodious song is from the movie Mella Thirantshathu Kathavu, released in 1986. In that nice movie Radha acted with the popular Tamil film actor Mohan. She appeared as a village girl deeply loving her maternal uncle. Radha expresses her love feelings in this song. The wonderful music by Ilayaraja and M.S,Viswanathan and sweet voice of S.Janaki made this song super hit. This song is from the movie named Anantha Ragam ,released in 1982, in which Radha starred with the actor Siva Kumar. In this video song Radha looks so beautiful since she was very young when she acted in that movie. The great music by Ilayaraja and amazing voices of S.janaki and K.J.Yesudas are the plus points of this nice song. Name of the movie: Nan Mahan Alla, released in 1984. The above great song is from the movie named Muthal Mariyathai released in 1985. In that movie Radha played opposite Great Tamil film actor Dr.Sivaji Ganesan. In that movie Radha loved Sivaji Ganesan, the village president, after hearing his heart touching story. Once Sivaji was wounded by the words of his cruel wife, Radha gave him nice encouragement. The music by Ilayaraja and lyrics by Vairamuthu made this song super hit. The singers are S.Janaki and Malaysia Vasudevan. The above nice song is from the movie Japanil Kalyana Raman released in 1985 in which Radha played opposite popular Tamil film actor Kamalhaasan. The whole song was shot at Japan Expo held in 1985. The music is by Ilayaraja and lyricist is Vairamuthu. S.P.Balasubramanyam and S.Janaki are the singers. Radha is a famous actress in Tamil,Telugu and Kannada industry on 1980's time.She acted more number of films acted together with Rajni Kanth,Kamal Hassan.I like her Mella Thirandhadhu Kadhavu. Songs of this movie was beautiful done by Ilayaraja.